The "Land Of ROCORI" has a great tradition of producing great baseball players. Our Cold Spring Springers have been to the State Tournament 40 times over the past 81 years and have won it 7 times. In a town with such a strong baseball tradition, it might not be surprising to find out that we have our own "Kirby Puckett Pl". 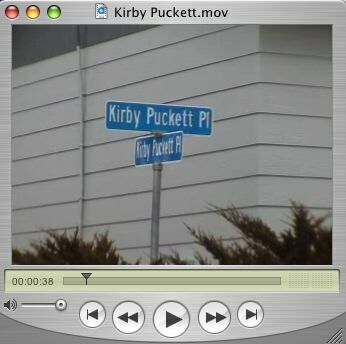 This street sign is located on the corner of a home that houses a mini Kirby Puckett museum. In this story you'll meet Ken who has collected over 2500 unique Kirby Puckett baseball cards. From mugs to bobble-heads, Ken has most of what has ever been produced representing the baseball career of Hall of Fame Kirby Puckett. With Kirby Puckett's death earlier this week, Ken reflects on the special baseball memories Kirby Puckett provided to him and his son as fans in the stands at the Metrodome. Ken repeated Carl Pohlad's quote, "They'll never be another "PUCK"!"